Hopefully by now, even if you do not generally follow “space news,” you are aware that humanity achieved something truly incredible on Wednesday, November 12, at 17:03 CET (Central European Time) / 11:03am EST — we landed a small robotic spacecraft on a comet! After 10 years in transit from Earth, the European Space Agency‘s Philae lander was successfully released from its mothership, the Rosetta orbiter, and descended to the surface of Comet 67P/Churyumov-Gerasimenko. 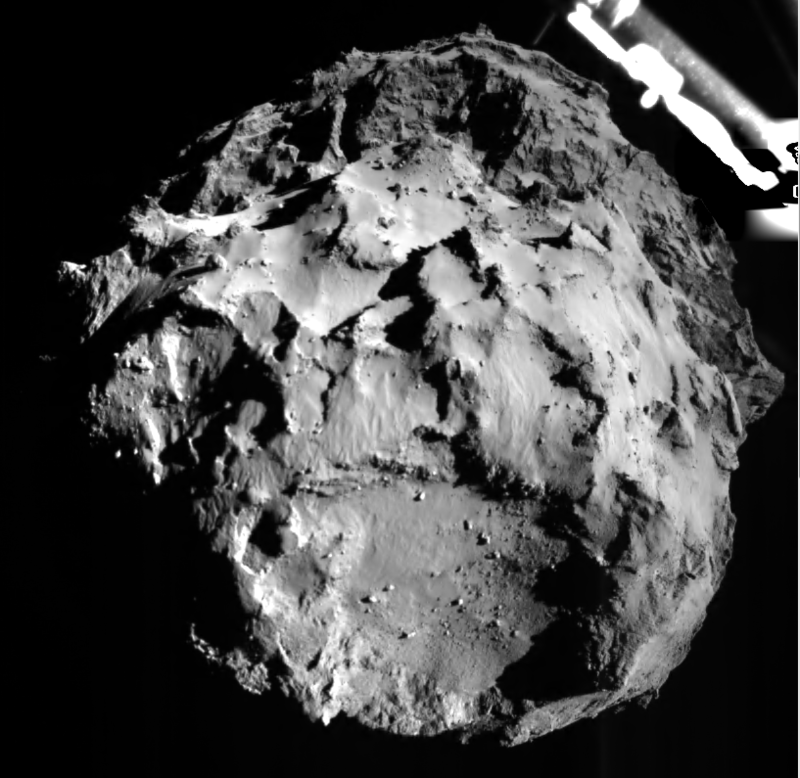 The dishwasher-sized lander is now the only object ever to perform a controlled landing on a comet. 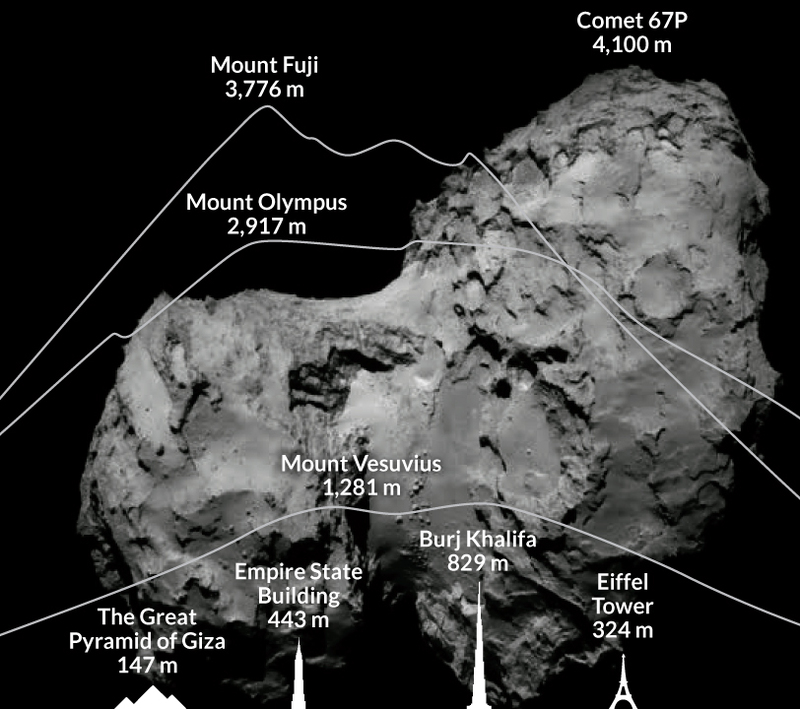 The Rosetta mission‘s purpose is not simply to learn more about comets. The mission objective is no less than “to help understand the origin and evolution of the Solar System.” Comets are composed of the oldest building blocks from which our Sun and the planets formed more than 4.6 billion years ago. If scientists study comets like 67P/Churyumov-Gerasimenko directly, they can gather data essential to understanding how the Solar System formed. ESA named the mission Rosetta because comets, like the hieroglyphic-covered Rosetta Stone, may provide the key to unlocking secrets and finding new understanding. Philae’s dimensions, in comparison, are just 1 × 1 × 0.8 m (3.3 × 3.3 × 2.6 ft). Did you know? The #Philea lander would weigh 220 lbs on earth, but only 1/30th oz on the comet’s surface due to its low gravity. It’s impossible to overstate how audacious a plan it is to attempt to land a spacecraft on a comet — a complex, dual-lobed (as it turns out) object that has a rotation period of about 12 hours and is traveling through space at 135,000 km (84,000 mi) per hour! NASA’s Jet Propulsion Laboratory explores the challenges of landing Philae on Comet 67P in their video, How Do You Land On A Comet? So, back to Philae’s landing on November 12… The Rosetta team faced its first major challenge of landing night when they discovered Philae’s cold-gas jets were not going to be operational. These jets would have fired just after the lander made contact with the comet’s surface, to help drive the lander downward rather than letting it bounce. After some deliberation, the team decided to proceed with the landing. Initial reports from ESA were celebratory, and rightfully so, based on initial data. And as ESA celebrated, the world celebrated along with them. NOTE: this really needs to link to a Storify collection of tweets, but due to time constraints at the moment, I’ve opted to highlight incredible artists who gave a nod to #CometLanding, including my brother, Thomas W. Blackburn IV (@ItinerantMonk). Pause the slideshow to see animated artworks in their entirety. The science team is now running on borrowed time, as Philae is only gathering about 1.5 hours of the 6 to 7 hours of sunlight it was expected to receive at its planned landing site. Further, the team has to exercise caution when deploying instruments, as the lander is obviously not anchored to the comet as was planned. Want to know more? The next ESA Rosetta briefing will be made via a Google+ Hangout on Friday. Here’s the info! I apologize for the rather sloppy nature of this post. I normally work on a post over a couple days, and I planned for this post to be much more in-depth, but I realized I needed to get it published or end up hopelessly behind the power curve. I could easily do a post just on the images ESA has released from the Rosetta orbiter and Philae lander, for example, as well as a pure-news post, but I wanted to get one “Philae primer” written, as well. Still curious about the Rosetta mission? I sure hope so! Explore ESA’s Rosetta Frequently Asked Questions for more insights.